When the leader of the ruthless Technic League calls in a favor, the mild-mannered alchemist Alaeron has no choice but to face a life he thought he'd left behind long ago. Accompanied by his only friend, a street-savvy thief named Skiver, Alaeron must head north into Numeria, a land where brilliant and evil arcanists rule over the local barbarian tribes with technology looted from a crashed spaceship. Can Alaeron and Skiver survive long enough to unlock the secrets of the stars? Or will the backstabbing scientists of the Technic League make Alaeron's curiosity his undoing? Victor Bevine is the best narrator I have ever listened to ever!!!!!!! In my opinion, he makes mediocre books phenomenal!!!!!!! I will listen to anything he narrates! 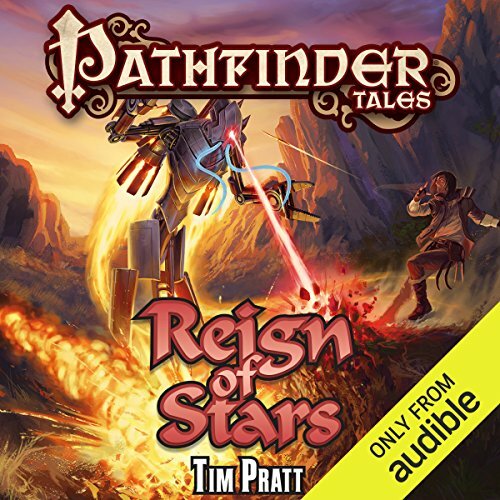 I would absolutely recommend this book to a friend especially one who is a fan of pathfinder. The setting chosen for the book is most likely the one least used in the games usually and the reason for this is that it has futuristic technology as you can tell from the cover art and the summary of the book. This is such an interesting idea to mesh fantasy with sci fi but its also very daunting and does not sit well with all players and for this reason it is often unused. This book provides a glimpse into this mysterious setting through the eyes of two amazingly fun characters. What was one of the most memorable moments of Reign of Stars? The most memorable moments from this book are honestly the moments where one of the main protagonists Skiver basically steals the show. I can’t really detail them without some spoilers but honestly they keep mentioning this other adventure the pair went on prior to this one which really just helped me decide which audio book I will be choosing next month. Their chemistry and quirks were just that fun to me. I would however recommend looking up a reading order for the pathfinder tales series. I had always assumed each was a standalone story and they are to a large extent. This book made perfect sense without having read the other one but it did spoil major plots for that book. I will be sure to do my research next time before I delve into another one. The narrators performance was excellent in this book. Each character has their own voice to an extent and he even picks up on some of the strange speech patterns described in this book. Top notch as I have come to expect from audible books. My only additional comments relate to the book itself. See the pathfinder tales books all seem to run nearly the same length which says to me there is some sort of mandated length for these books. This I feel puts the authors into a bit if a tight spot when it comes to giving the reader everything they want. This book really developed characters extremely well but defiantly at the sacrifice of the actual adventuring you might expect from a book based on pathfinder. I felt this one was especially lacking in the adventure part and really came down to political squabbling. There wasn’t even really a villain in the book which really threw me off. There were bad people doing bad things but mostly to each other. Honestly it didn’t ever feel like the main characters needed to be there really. In any other book this would be criminal but the author did such a good job of getting me invested in them that I didn’t really mind. All in all I would say this is worth a read but if you’re looking for a pathfinder novel there are better ones to be found. Hellknight would be one I would recommend thoroughly. skiver is the best thing about this book. the characters are the real reward for this one. the way they grow and learn is just wonderful and the action and intrigue is just as good. Story and main protagonists quite interesting and likeable though the voice actor had a pretty limited range and many characters sounded very similar. Worth a listen for the story and author's humour.